This page is about the American naval fighter F4U-4B. For other uses, see F4U (Family). The F4U-4B Corsair is a rank IV American naval fighter with a battle rating of 5.7 (AB/RB/SB). It was introduced in Update 1.71 "New E.R.A". The F4U-4B is similar to the F4U-4 which precedes it, mainly in handling, but the main difference and the reason why it sits at a higher BR is the vastly more powerful armament of 4 AN/M3 20 mms and an up-rated engine. This gives it much more flexibility in its play style and makes it easily one of the best 5.7 fighters in all modes when flown properly. While it retains the standard Corsair traits of excellent performance in the horizontal, namely speed, energy retention, and instantaneous turn, its improved engine allows some fighting to be done in the vertical. This is to an extent of course and you don't want to try and out vertical a Griffon Spitfire or a Bf 109 K-4 unless you absolutely know what you're doing, but you can easily stall out planes like Fw 190 As which don't excel in the vertical. This is also aided by the flaps which are very good; the takeoff and landing flaps lower the stall speed immensely but rip easily above 250 kph (155 mph) IAS, and the combat flaps boosting the turning significantly and can be used up to about 450 kph (279 mph) IAS. Even without flaps, F4U-4B is an impressive turner despite its weight and can turn with many planes at high speeds (above ~500 kph/~300 mph), at least enough to get a shot off. With flaps it can turn with a surprising number of planes at low speeds, although as before this is to an extent. Also, be wary of the rudder which rapidly loses effectiveness above 550 kph (340 mph) and makes shots difficult against evading enemies, although this is alleviated a bit by the powerful armament and fairly good roll rate. The F4U-4B should be flown primarily at low altitude because its engine lacks power at higher altitudes. Here, it boasts an impressive climb rate (about 25 m/s when spaded), very good acceleration, and a high top speed. You should aim to be around 3-4km at the start of the battle and go after low enemies using boom and zoom tactics, then use your speed to outrun anyone who dives on you. You can then use your engine power and energy retention to gain an energy advantage over them and easily kill them. If you find yourself in a tough situation, don't be afraid to go a bit aggressive because this plane accelerates very well at low altitude and the extremely powerful guns makes it easy to secure kills quickly, but don't stall yourself out at the deck amidst a cloud of enemies since you'll be an easy kill. This plane can easily dogfight with Fw 190 Ds/152s, Tempest Mk Vs, Sea Furies, and similar planes, can dogfight with difficulty with Bf 109s and similar, and should avoid dog-fighting unless as an absolute last resort against Spitfires, Ki-84s, A7Ms, N1Ks, and similar. Fortunately, the F4U-4B is usually faster than most planes it can't dogfight. It's far faster than most Japanese and Italian props and all Spitfires up to the Mk 22 at low altitude. 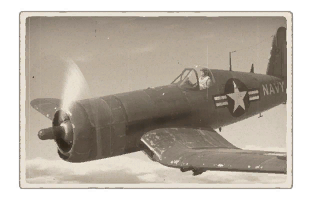 In an up-tier against superprops like Tempest IIs, Mk 24s, and P-51Hs and F8Fs if you get a mixed battle, you have to rely on coming in with an advantage as with any other plane in an uptier, though this is made easier with the F4U-4B's excellent top speed. 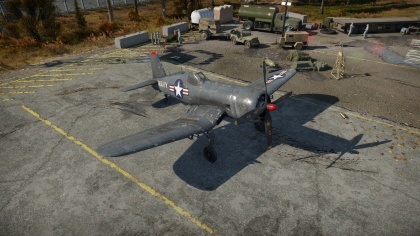 The F4U-4B is devastating in the right hands, and is one of the best planes the US tech tree has to offer. You're best off engaging the F4U-4B at higher altitudes where its performance suffers. You can also try bleeding their energy in hard vertical maneuvers where it struggles, but be careful while doing this especially at low altitude since a potential opponent can still use the Corsair's stall characteristics combined with its engine power to get a shot off, which can be devastating no matter how short a burst. This page was last edited on 7 April 2019, at 19:02.